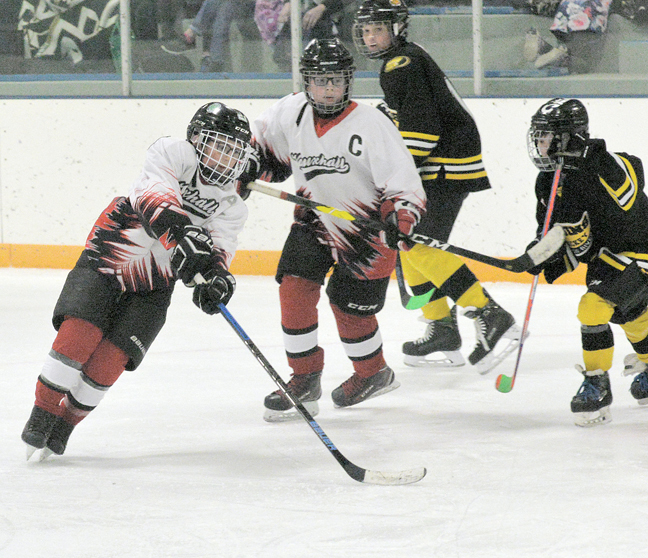 Vauxhall peewee Sabres had a solid run as it hosted ATB Financial Tier IV hockey provincials this past weekend at the Vauxhall Arena, before eventually bowing out in the semifinals. The team managed to go undefeated in pool play, starting off with a big 11-3 victory over Plamondon Cougars last Thursday. Landon Howg potted six goals and Conrad Mehlhaff had two goals. Sutten Emelson, Damian Beswick and Charleigh Broderson had singles. The Sabres continued on with a 10-4 victory over Bow River Bruins on Friday, shortly after opening ceremonies. Howg potted the hat trick and Mehlhaff tallied twice. Sutten Emelson, Beswick, Broderson, and Austan Axelson had singles. The Sabres finished off pool play by doubling up Warburg Sharks 8-4. Howg and Beswick both had hat tricks and Berkley Emelson and Axelson had singles. The Sabres provincial run would end with a 9-5 loss to Loon River Jets, the team that would eventually go on to win provincials with a 6-5 victory over Irvine Bulldogs. Howg would get another hat trick and Beswick and Berkley Emelson had singles. Howg would end up leading all tournament scorers with 24 points overall and 16 goals. Cason Van Hal was third in overall goals against average while also earning three victories in net.